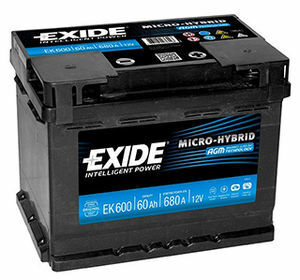 Exide Start Stop AGM car batteries are the premium option for Micro-hybrid vehicles and are especially suited to those with Stop & Start and Regenerative Braking systems. Absorbent Glass Mat (AGM) technology has been jointly developed by Europe's major micro-hybrid vehicle manufacturers and is now the world's most advanced car battery technology. AGM provides a superior performance in extreme cycling applications including partial state-of-charge and high-charge acceptance operations. This feature is especially vital in micro-hybrid cars with Regenerative Braking and Stop & Start systems. Exide AGM batteries can also be used in domestic and leisure situations Exide batteries have an average life-span of around 3 times that of standard batteries. They are also hermetically sealed and fitted with top gas recombination and pressure control valve systems which makes them one of the safest battery choices for passenger compartment installations. The fact they are so well sealed also makes them safe to transport, including air travel. Unlike some FLA and SFL batteries, AGM batteries give 100% of their stated capacity and can be oriented in any direction. There's no need to keep them upright which can be very useful, particularly in leisure applications. Once fitted they are totally maintenance free At battery2u we sell the entire range of Exide start stop AGM batteries and can offer free next-day delivery on all orders placed before 4pm. We are also able to offer a 4 year warranty on all Exide AGM batteries. Within the Merseyside area we can also offer same day delivery and a fitting service.